Critical training opportunity for staff and volunteers of non-profit, religious, social service and charitable organizations who want to become accredited representatives and provide immigration legal services to qualified immigrants. 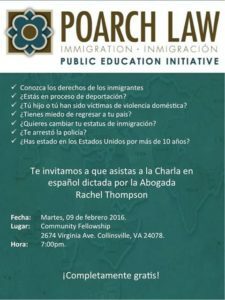 Provided by Baptist General Association of Virginia and Poarch Law (Immigration Law), this program provides the initial training necessary for BIA accreditation. 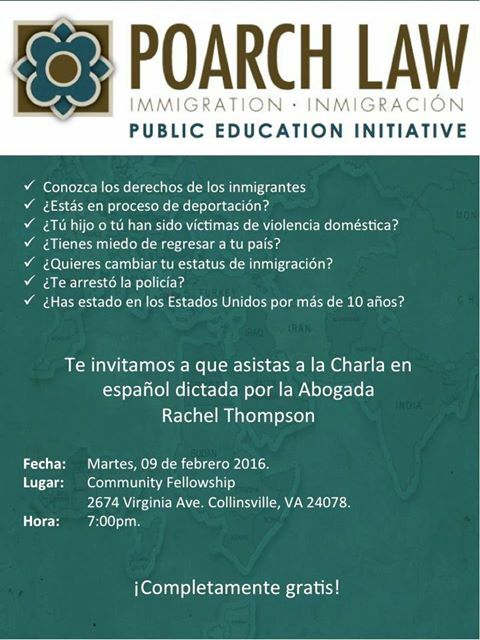 Attorneys from Poarch Law (Immigration Law), Calderón Seguin PLC and Legal Aid Justice Center are teaching this course for free using materials prepared by Immigrant Legal Resource Center (ILRC). All proceeds from registration fees go to the BGAV to cover certain costs for the week-long program. The training will occur March 14, 2016 – March 18, 2016, all day at the Virginia Baptist Resource Center 2828 Emerywood Parkway Richmond, VA 23294. Poarch Law joins Total Action for Progress Domestic Violence Services in their Christmas Celebration at their location on Williamson Road. Telemundo will present a special about the abuses of the border patrol. Attorney Christine Poarch will be featured in the series. Attorney Christine Poarch will be speaking at the AILA Texas, Oklahoma & New Mexico Chapter Conference in Punta Cana, Dominican Republic on recent case law involving visa denials, plenary power and consular nonreviewability. Attorney Christine Poarch will be speaking today, October 21, 2015, on special immigrant juveniles with Nicholas Marritz of Legal Aid Justice Center at the Virginia State Bar Access to Legal Services Committee’s Pro Bono Conference. Nuevas Raíces published an article on the Poarch Law Fall Stakeholder meeting.